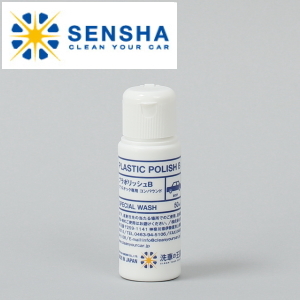 Plastic Polish is specifically specialized in polishing plastic car parts. Compounds for car body cannot polish plastic parts because materials are totally different and they have the different surface conditions and finishing. Likewise, glass compounds could cause scratches on surfaces of plastic parts. We re-reviewed and determined the ingredients only for polishing plastic parts, hence Plastic Polish delicately targets to improve a surface condition of plastic parts. By reading and following the instruction manual attached, conditions of dullness and scratches of plastic car parts will be improves dramatically to restore the original beauty. We have received many requests from our customers that have condition problems of plastic parts used for a car. Consequently, we began R&D. We have researched and re-reviewed compounds and select the ingredients suitable only for polishing plastic with the significant number of testings. If your have problems such as dullness and scratches of plastic car parts, Plastic Polish will satisfy your requirements. Plastic Polish is specifically specialized in polishing plastic car parts. Compounds for car body cannot polish plastic parts because materials are totally different and they have the different surface conditions and finishing. Likewise, glass compounds could cause scratches on surfaces of plastic parts. We re-reviewed and determined the ingredients only for polishing plastic parts, hence Plastic Polish dedicatedly targets to improve a surface condition of plastic parts. By reading and following the instruction manual attached, conditions of dullness and scratches of plastic car parts will be improves dramatically to restore the original beauty. Plastic Polish contains 2 kinds of liquids depending upon a condition of dullness and scratches your car has. Conditions of plastic car parts are very varying depending upon what type of plastic materials and where you keep and park your car. In order to support all conditions, Plastic Polish is a package of two kinds of liquid and two kinds of sponges. Plastic Polish is the dedicated polishing product for the removal of scratches, dullness and stains and stains of plastic car parts. It improves conditions most of cases. The product is a compound not a coating product. If you polish well, conditions will improve more. It is specially made for plastic visors and covers of tail lights and headlights. Please do not use the product on rough surfaces like bumpers. Motorbike shields are made of similar materials as car door visors. Scratches, dullness and stains are improved by polishing well with Plastic Polish. If you leave this type of dullness without maintenance, the condition will likely get worse. This could cause an accident due to the lack of visibility. An application is the same as for a car. You may wish to remove the shield from a motorcycle body for an application.